Intertops Poker and Juicy Stakes Poker are well known for hosting online satellite tournaments that send winners to exotic locations to play poker. Starting Thursday they're hosting their latest satellite tournaments and this time the winner will compete in the prestigious European Poker Championship in Velden, Austria this summer. You can start the three-tier tournament series with a $3 buy-in for a Step 1 tourney and then try to win your way to the Final from there. Or you can buy-in at any stage. The winner of the Final will get a $4000 prize package that includes €2700 buy-in to the EPC main event (July 27th to 30th), accommodation at a premium hotel and cash for travel expenses. Last year three online satellite tournament winners from Intertops and Juicy Stakes (Tim O’Keefe, Gabor Kresco and Emil Hegedus) competed in Velden. 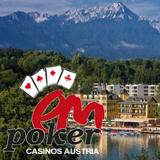 Poker rooms sending online winners to compete in prestigious poker tournament in Velden, Austria this summer. Tim was eliminated early on Day 3 but Emil went out in 6th place. He was disappointed it wasn't a win, but the $26k in his pocket made him feel better very quickly! Players from all over Europe (especially Germany and Italy) will play tournaments and cash games on more than 40 tables at the exclusive lakeside resort. Enter European Poker Championship online satellite tournaments under the Tournaments tab in the poker software at either poker room. For details see Intertops Poker EPC Velden Satellite Tournaments or Juicy Stakes EPC Velden Satellite Tournaments. Both Intertops Poker and Juicy Stakes welcome players from anywhere in the world. They’re the busiest online poker rooms on the Horizon Poker Network and also offer a selection of casino games. This weekend you can get 35% of your last deposit back if you bust playing the poker room’s slots.